This shot was taken close past midnight in Svolvær. It took numerous attempts to get the required exposure as the clouds kept rolling in and chucking down snow on us. The weather was changing every 5 minutes. Finally managed to get this 130s exposure. In the background you can see the clouds already rolling in for the next round. 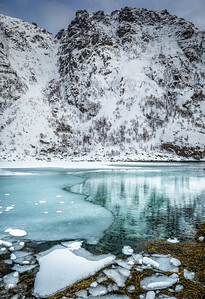 A half frozen lake surrounded by towering snow capped peaks. 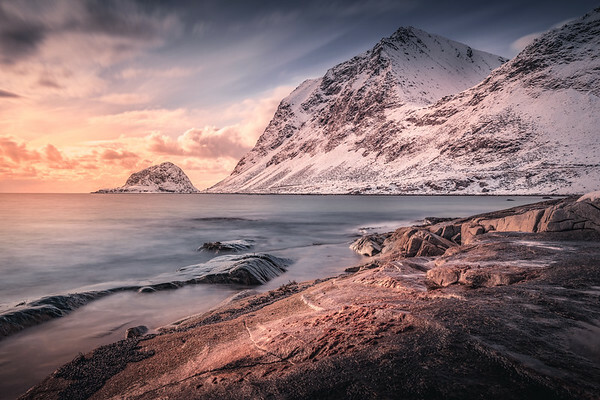 Lofoten is filled with such amazing views. And this was right next to the road.. no long treks needed. 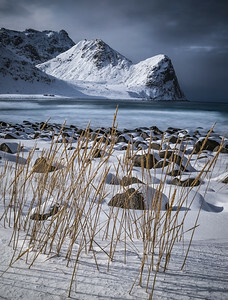 Lofoten is indeed a landscape photographers dream destination. I contemplated whether to crop out the sea weed in the foreground but decided against it. I think it adds nice foreground interest and a dash of yellow in the obvious blue tones. What do you guys think? I managed to wake up for sunrise on this particular day (which is a massive task for me). The sky was overcast and gloomy. I setup the camera on the tripod and waited in hope of a break in the clouds to let some light through. As I was about to give up and head back, this tiny little hole opened up to let some light through. The light literally lasted for less than a minute and about 2 minutes later a blizzard. Glad that I waited just long enough. I love how this grass stands tall while enduring the extreme weather. 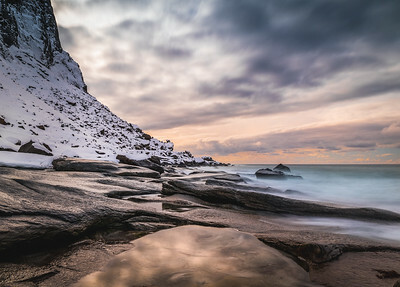 While on the subject of enduring the weather, check this, Unstad beach is an Arctic surfing beach which is quite popular with extreme surfers. 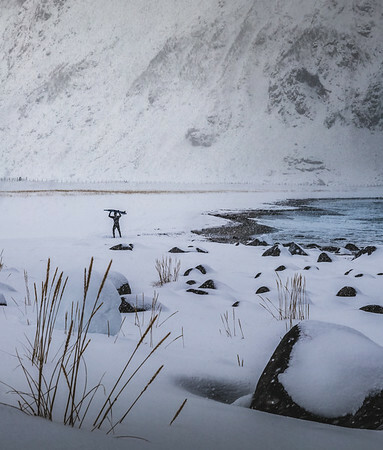 We reached there in sub-zero condition (-10C almost), and believe it or not there were people surfing. We met a couple of them who had come all the way from Australia to surf here. 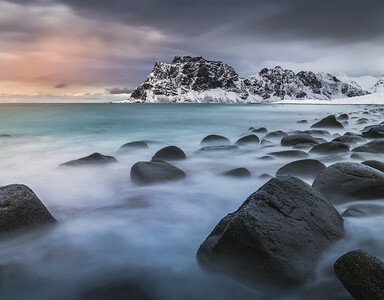 A long exposure (30s) shot at Uttakleiv Beach in the Lofoten Archipelago using the rocks as the foreground just as the sun was setting and casting a warm glow through an opening in the clouds to the left while dark storm clouds rolled in from the right, creating this beautiful scene with orange, blue and magenta hues. 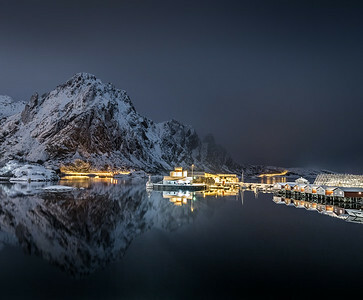 This shot of Svolværgeita was taken close past midnight in Svolvær. It took numerous attempts to get the required exposure as the clouds kept rolling in and chucking down snow on us. The weather was changing every 5 minutes. It took a good 45 minutes to get this 2.5 min exposure which was needed because of the low light and to get a near perfect reflection. 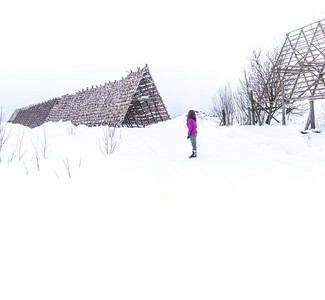 We were out roaming in Svolvær in the Lofoten archipelago during a blizzard and everything was almost white. You could only make out the dark shapes of the Fish flakes which are used to dry stock fish. This created an almost black and white landscape, so we decided I decided to add @instasurs in the frame and create this high key shot with a dash of colour. What do you think? 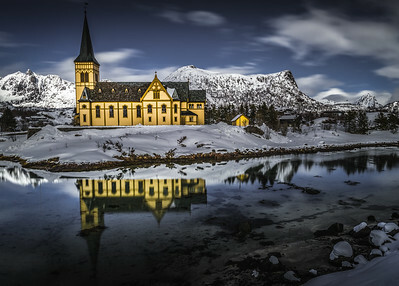 A long exposure shot at the Lofoten Cathedral. I was lucky to be there when the tide was low and there was just enough water to create a brilliant reflection without being disturbed by wind or waves. I had to climb down from the road in knee deep snow to get right next to the water in order to get a complete reflection of the church. 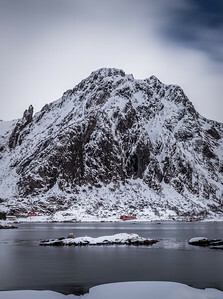 A long exposure pano taken from the porch of a rorbu cabin, with a cabin in the foreground and a cabin just under the mountain (Fløyfjellet) in the background just to give an idea of the scale of this place. Love how these red rorbu cabins are scattered all over the place in Lofoten adding bright red colour to a white landscape. A view right outside our door step in Svolvær. 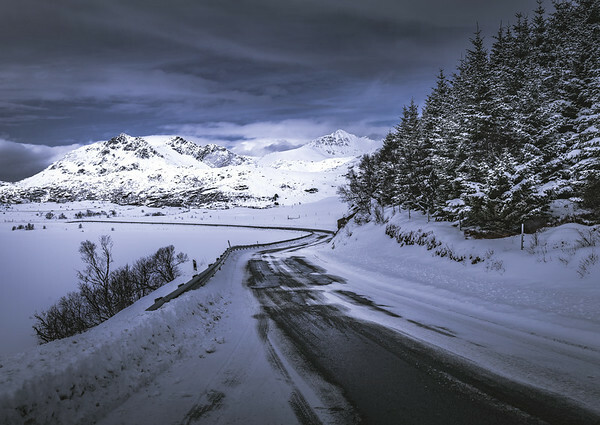 The mountain seen here is Fløyfjellet. The mountain is popular among climbers, in particular Svolværgeita, a 150 m (490 ft) high pinnacle at the southern face which resembles a goat with two horns. 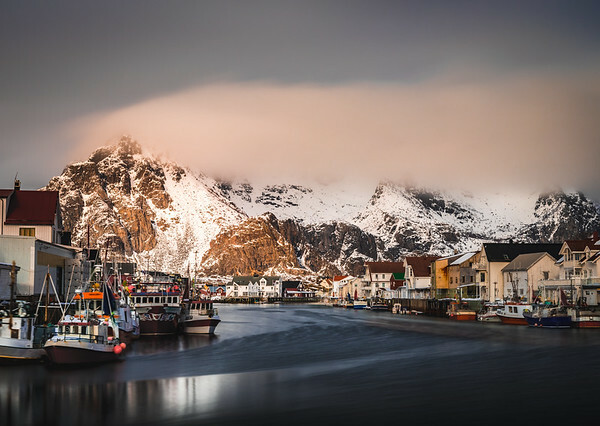 Henningsvær is a beautiful little fishing village located in the Lofoten Archipelago. This is a shot of the picturesque village harbour a little before the sun started to set. Just minutes before this shot, it was completely overcast with heavy snowfall and then an opening appeared in the clouds just enough to allow the mountain in the background to be lit by the warm glow from the evening sun. There are few sights more beautiful than an arctic sunset. Although the sun was still over the horizon when I took this shot, the good thing about being so close to the north pole is that you get these golden colours well ahead of sunset and they last for quite a while giving you plenty of photo ops. I love how this grass has stood the test of extreme weather and still stands tall. The weather on the day was literally changing every 5 minutes. We were here for 45 minutes to an hour and we experienced multiple bouts of snow and sunshine, we got to see calm-ish seas and stormy seas all in less than an hour. In this picture you can see the storm and snow approaching from the right while there is still some sunshine coming from the left. Do you surf? Would you surf here? 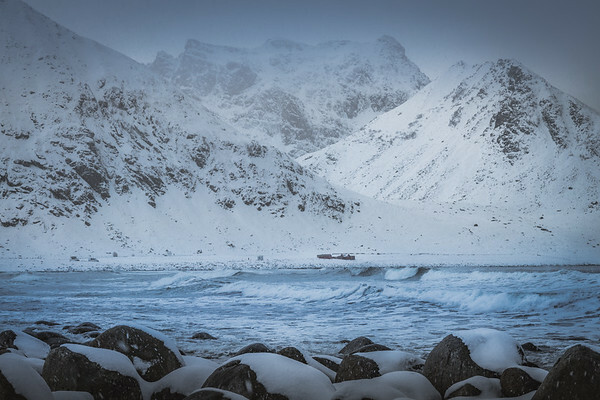 Unstad beach is an Arctic surfing beach which is quite popular with extreme surfers. It is also the location of the northern most surfing school in the world. We reached there in sub-zero condition (-10C almost), and believe it or not there were people surfing. We met a couple of them who had come all the way from Australia to surf here. An overhead shot of a winding trail through a Coniferous forest in the Lofoten islands. 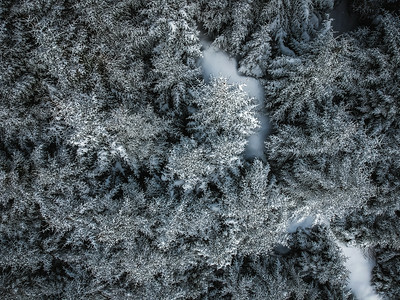 We couldn't really walk this trail because of the deep snow, next best thing: Get a drone shot! 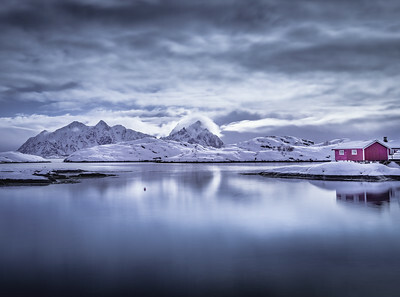 Do you know why people in the arctic region paint their buildings in bright colours? Many believe that it is to add colour to their towns/villages as most of the year the landscape is completely white these are the only colours they get to see outside. Not just that, but the buildings are easier to spot in a blizzard making it easier to find your way home. 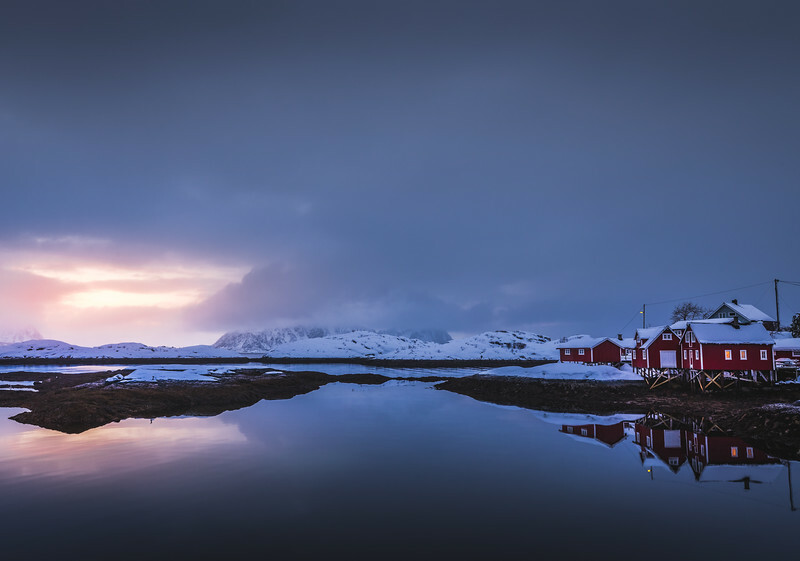 Henningsvær is a beautiful little fishing village located in the Lofoten Archipelago. 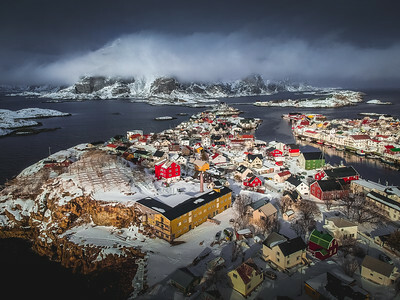 This is a drone shot of the picturesque village just after a snow storm passed through. Minutes before this shot, it was completely overcast with heavy snowfall. 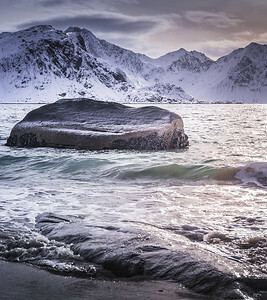 Uttakleiv Beach is the most photographed beach in Lofoten and it's easy to see why. 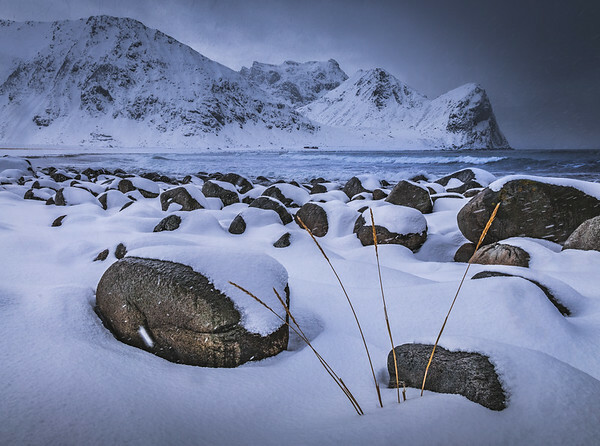 Beautiful endless field of snow, gorgeous turquoise and blue ocean, gigantic boulders for some fantastic foreground and the jagged peaks of Lofoten for a dramatic background. What more could you ask for? 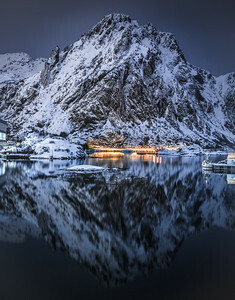 A calm and still morning in the Lofoten Archipelago. I used long exposure to smoothen out the water and get some motion in the clouds rolling over the hills in the background. I think it gives a certain feeling of serenity to the image while the Rorbu cabin adds just a dash of colour and some scale to the scene. I took this long exposure while the low clouds caught the last rays from the sun setting behind the mountain on the left. One thing this photo does not show is how slippery the rocks were, I almost got swept into the sea while setting up my tripod on these rocks. A little quiz for today - How many people can you spot in this picture? 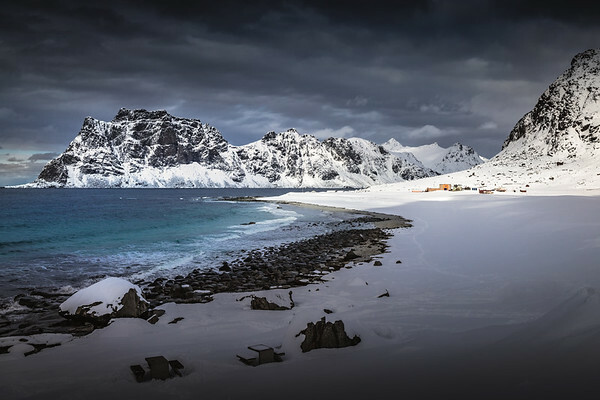 A lonely house stuck in the middle of a stormy sea and towering peaks while a snow storm lashes down on Unstad Beach. Just as we were leaving Haukland Beach, I noticed a couple of Gulls sitting on this rock in the middle of the sea. I thought it made for a nice shot keeping the birds in the middle and using another rock to add some foreground interest and the enormous snow covered hills in the background. It was late in the evening and the sky was already glowing with warm light giving the scene some colour and contrast. Somewhere on the way from Unstad beach to Haukland beach, we took a brief pit stop and it turned out to be an amazing photo opportunity. Honestly, anywhere you stop in the Lofoten Islands, you are guaranteed amazing views and photo ops, but on this particular occasion, mother nature decided to play along and create an opening in the clouds just enough and placed perfectly to shine a spotlight on the mountains in the background, completely transforming the scene from gloomy to dramatic in a matter of seconds. 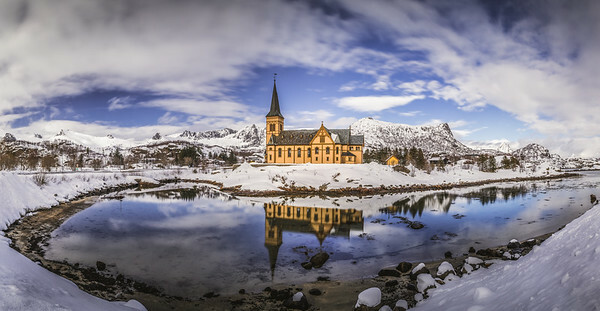 A 7 shot panorama of the Vågan Church in Nordland county, Norway. The low tide caused most of the water to recede converting the fjord to a pool of still water creating mirror like reflections. I used a 10-Stop ND filter to get long exposures to further enhance the reflections. Each exposure was 15s long.